Cars sit along the street in Houston following Hurricane Harvey on Aug. 30. Car rental companies made preparations to move vehicles into affected areas even before the storm hit. Lisa Martini, with Enterprise Holdings, the nation's largest car rental company, says that in anticipation of this hurricane season, the company started getting ready to send cars. "For example, in Texas we started anticipating the replacement vehicle need ... . We brought in about 17,000 vehicles in Texas and that was part of that recovery process," she says. First responders, officials, volunteers, residents and reporters need cars in the immediate aftermath of a disaster, Martini says. "We really just understand where the demand is highest and, especially when a disaster hits, we just move those vehicles where they're needed," she says. Enterprise, which also owns the Alamo and National Car Rental brands, has 6,400 locations throughout the U.S. As peak vacation season ended, just before the hurricanes, cars came from as far away a Green Bay, Wis., Seattle and Cape Cod. That shift could have had an effect on vehicles in, say, Washington state. Martini says that for a couple of days, renters who didn't have an insurance claim might have had to wait a little bit longer. "The Mustang might have not been where you would have hoped it would have been," she says. Chris Brown, executive editor of the trade publication Auto Rental News, says preparing for natural disasters is a part of the DNA of the rental car companies. Moving the 2.1 million vehicles in the rental fleet around the country is a microcosm of what's to come. Rental cars may appear low tech on the surface, but Brown says the companies "have the ability to use artificial intelligence now, big data, combined with the collective wisdom of people that have been in the industry for 30 years to understand a customer's wants and needs." Despite their low-tech image, car rentals are the wave of the future. Getting you the car you want, when you want it, for the time you want it will be increasingly important skills to have as cars become autonomous. Fleet management admittedly is not something the average consumer is likely to think about. We just expect that the Mustang we wanted will be there. Brown says fleet management is paramount to a successful operation. "But more than that, it only gets more important moving forward into this era of autonomous vehicles," he adds. Among the many things damaged in the recent hurricanes are cars, lots of them - more than a million in the U.S. alone. Often even before the first rain falls in a hurricane, rental cars are on the way. As NPR's Sonari Glinton reports, rental car companies see natural disasters as trial runs for the future. SONARI GLINTON, BYLINE: There have been other natural disasters that severely disrupted the auto industry, like the Japanese tsunami. Factories were shut down. Parts were unavailable. Fortunately that wasn't the case with hurricanes Harvey and Irma. And car companies, for instance, already have healthy inventories, so there's no immediate pressure to ramp up car production. It's the rental car companies that are feeling the pressure. LISA MARTINI: Lisa Martini with Enterprise Holdings. GLINTON: Enterprise is the biggest car rental company, and in many ways, they see part of their mission as disaster recovery. MARTINI: For example, in Texas, we started anticipating the replacement vehicle need that we were going to be seeing. 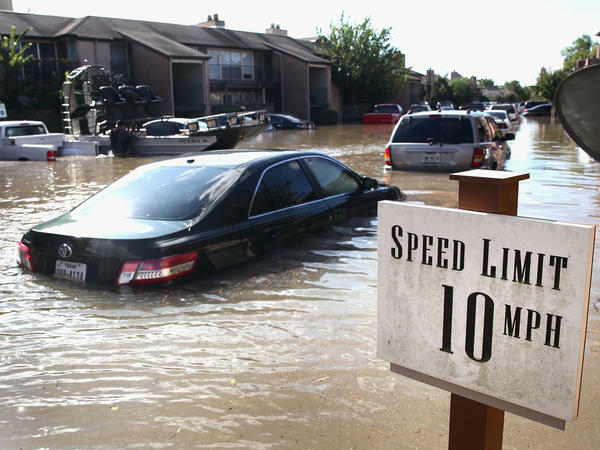 We brought in about 17,000 vehicles in Texas. GLINTON: First responders need cars along with officials, residents, even reporters, as well as thousands of workers at rental car facilities. MARTINI: We really just understand where the demand is highest. And especially when a disaster hits, we just move those vehicles where they're needed. GLINTON: Enterprise has about 6,400 locations around the U.S. The company plays sort of a zone defense. Now, that could have an effect on those looking for vehicles in, say, Washington state. MARTINI: For a couple of days, the renters that didn't necessarily have an insurance claim might've had to wait a little bit longer or, you know, might have found that the Mustang might have not been where you would've hoped it would've been. GLINTON: Chris Brown - not that one - is executive editor of the trade publication Auto Rental News. He says preparing for natural disasters is part of the DNA of a rental car company. He says rental car fleets have about 2.1 million cars, and being able to move those cars around is a microcosm of what's to come. CHRIS BROWN: The ability to use artificial intelligence now, big data combined with the collective wisdom of people that have been in the industry for 30 years to understand the customer's wants and needs. GLINTON: Now despite their low-tech image, car rental companies are actually the wave of the future. Getting you the car you want when you want it for the time you want it will be increasingly important skills to have as cars become autonomous. Brown says right now managing a rental car company is part science, part art. Increasingly, this is what the overall auto business is going to be about. BROWN: Fleet management is paramount to a successful car rental operation. But more than that, it only gets more important moving forward into this era of autonomous vehicles. GLINTON: Brown says the rental car companies are constantly learning from disasters not just how to face the next disaster but how to face the self-driving future. Sonari Glinton, NPR News. Transcript provided by NPR, Copyright NPR.